Vertical cracks in Alberta basement walls are often caused by the shrinking of concrete as it cures; if the edges of a small crack feel even as you run your fingers along the sides, this is likely the reason why. However, the water that leaks into the basement through these openings can present a significant problem for your home. 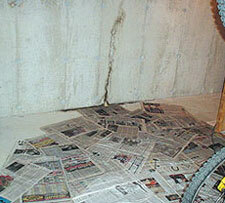 Contact us by phone or e-mail today for a FREE written basement wall crack repair estimate today! It's possible to permanently repair a foundation wall crack. Minor cracks that show no leaking may need only a cosmetic repair, and will not be a problem unless they reoccur. 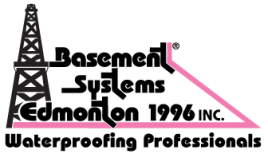 Among the many different methods of repairing basement wall cracks, Basement Systems Edmonton recommends the patented FlexiSpan® Basement Wall Crack Repair System. Read on to learn more about the FlexiSpan®, or click here to learn more about alternate foundation wall repair methods. We provide this system to residents in Grande Prairie, Sherwood Park, St. Albert, Leduc, Camrose, Grande Prairie, Spruce Grove, Fort Saskatchewan, Wetaskiwin, Lloydminster, Nisku, Cold Lake, Stony Plain, Lacombe, Bonnyville, Westlock, Hinton, and the surrounding areas in Alberta. The most effective way to stop a basement wall crack in Alberta from leaking water is to seal it with a high-viscosity polyurethane polymer. Unlike epoxy, polyurethane can bond well to both wet and dry concrete, and its high viscosity will allow it to fill even hairline cracks. Unlike materials such as urethane, caulk, and hydraulic cement, the polymer used in the Flexispan is able to expand to as much as 20 times its volume when necessary. This allows it to maintain its seal even when the wall goes through its natural process of shifting, moving, expanding, and contracting. Of course, even the best polyurethane polymer can experience a partial failure (95% of the water should still be stopped), and you want NO water in your basement, right? To address this, Basement Systems Edmonton takes the process one step farther. If flooding water makes its way past the seal, a foam strip installed over the top of the crack repair will intercept it. This strip guides the water down the wall and underneath the floor, sending it to a small drywell created there during installation. This foam strip is covered with a special coating that gives it an attractive, tooled-off appearance, and the drywall is covered over with fresh concrete. The end result of the FlexiSpan® installation is a professional-looking and top-performing basement wall crack repair. The installation is fast, easy, and cost-effective. 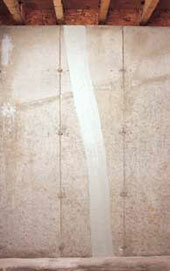 Similar repairs can also be applied to pipe penetrations and other types of basement wall openings. If you live in Alberta, including the areas of Edmonton, Grande Prairie, St. Albert, Sherwood Park, Grande Prairie, Spruce Grove, Camrose, Leduc, Fort Saskatchewan, Lloydminster, Wetaskiwin, Stony Plain, Lacombe, Cold Lake, Nisku, Bonnyville, Hinton, Westlock and all areas nearby, call Basement Systems Edmonton for a FREE basement wall crack repair estimate today! We'd be glad to help you.